This round mat calculator only works if your input measurements are correct. 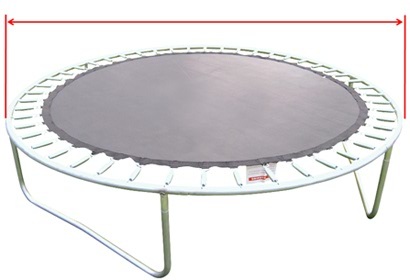 Please make sure you take the time to measure your trampoline carefully. 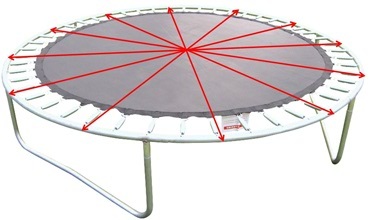 To measure the diameter of your round trampoline, you need a tape measure and a helping hand. Start at the outer metal edge of your trampoline and measure straight across to the opposite side, again to the outer metal edge. We need 4 accurate frame diameter measurements in millimetres (mm) so we can calulate the average frame size for your replacement mat. 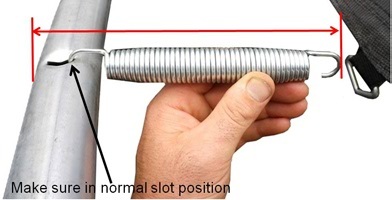 Measure your spring length with a spring off the trampoline, unstretched, including hooks in millimetres (mm). Then count how many springs your trampoline has. Any replacement needs to be fully attached to your frame. Now measure from the end of your frame to end of the spring, including the hook. Make sure the spring is attached to the frame, but not to the mat. There should be no tension on the spring in this measurement.